It's not a beauty contest, but the 17th annual Globe and Mail ranking of online brokers does put a lot of emphasis on looks. The dozen firms in the ranking have converged on cost to a point where sub-$10 commissions for all are near universal. Most firms offer similar levels of research on stocks and exchange-traded funds, and most now offer tools to show how your account has performed since you set it up. Appearance is the biggest differentiator between firms now, and that means big changes in this ranking. A few firms have upgraded their public and/or client websites recently and it's now becoming apparent how much better a well-designed website can make the process of choosing and using a broker. Accordingly, the client experience at each firm, including the usability of the website, has taken over from cost as the No. 1 factor in the ranking process. This year's overall winner is Virtual Brokers. VB has reclaimed the top spot from Qtrade Investor, now sharing second place with hard-charging Questrade. In third is a name you haven't seen for a while in the upper echelon of this ranking. It's TD Direct Investing, which has introduced a strikingly good new client website. The pressure's now on the other bank-owned firms to catch up. As ever, this ranking is designed for mainstream investors needing access to a variety of registered accounts and tools for portfolio-building and researching investments. All brokers included here are members of the Canadian Investor Protection Fund (CIPF), which protects account assets of up to $1-million if a firm goes under. -The client experience (30 per cent): Much of the emphasis here is on having a clean, easy to navigate website that is simple and engaging to use, even for novices. 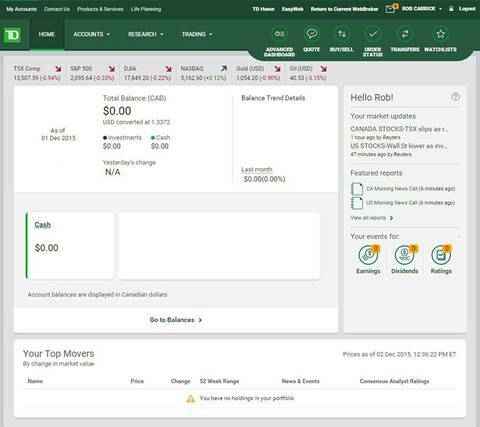 This category also emphasizes the Web interface for trading stocks, the availability of U.S.-dollar registered accounts and the variety of investments offered online, including low-cost mutual funds, guaranteed investment certificates and investment savings accounts (great for holding cash). We also consider whether there is an option for online advice. -Cost (25 per cent): Stock-trading commissions get the most weight in this category, with a small penalty applied for charging electronic communication network (ECN) fees for some trades. The availability of commission-free ETFs also has a major influence. Points also go to brokers who have simplified account fees by charging the same amount on all types of accounts and offer easily achievable ways to avoid these charges. -Account reporting and maintenance (25 per cent): Brokers that score well here use graphics effectively to help you monitor your asset allocation and check how your account has done since you set it up. They also answer client queries by secure e-mail and provide an extensive online archive of account and tax documents. -Research and tools (15 per cent): This category covers the variety of a broker's research, financial planning and stock/ETF/mutual fund screening tools. A useful ETF centre is emphasized. -Innovation (5 per cent): Emphasizes a firm's recent innovation record, but also considers the long-term.